1. The S&P 500 is two standard deviations above its 20-day moving average. 2. Sentiment indicators (such as the $VIX Volatility Index, Equity Put/Call Ratio and CNN Money Fear & Greed Index) are now at overbought levels. 3. Bearish divergences have appeared against the Mid and Small Cap indices which are lagging below their highs of 25 February 2019. 4. Bearish divergences have appeared against momentum indicators, such as RSI, Stochastic and MACD, which are lagging below their February highs. 5. 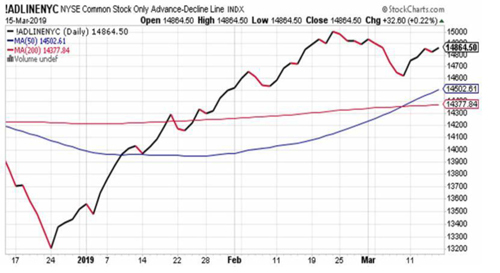 A bearish divergence has appeared against breadth (the cumulative total of daily advances minus declines for NYSE common stocks) which remains below its high of 22 February 2019 (see Chart).